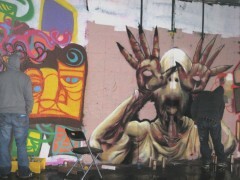 It wouldn’t be street art if it didn’t stand up to the elements, and even today’s (ongoing) icy rain couldn’t shut down Albus Cavus’ Monster Mash Halloween paint party at Garfield Park. 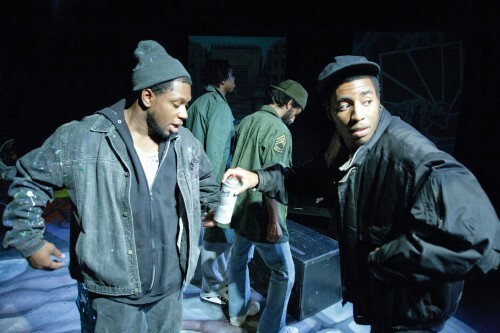 The nonprofit art organization, which offers workshops and after school programs and curates a series of what they call “open walls” for graffiti artists, welcomed local artists, performers, skaters and the public at large to an all-day community “expression” jam: skateboarders rode the hand-made ramps of the skate park, members of Urban Artistry got a dance cipher going and, of course, everyone from little kids to pro taggers repainted the open wall spaces tucked beneath Southeast Freeway. 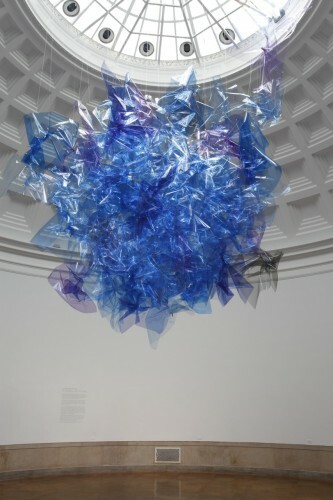 Spencer Finch, Passing Cloud, (394 L Street NW, Washington, D.C., July 7, 2010), 2010, dimensions variable. Fluorescent light fixtures and lamps, filters, monofilament, and clothespins. Courtesy of the artist and Galerie Nordenhake, Berlin. Photo: Chan Chao. - Walt Whitman, “ Abraham Lincoln,” No. 45 (August 12, 1863), Specimen Days in Prose Works, Philadelphia: David McKay, 1892, p. 43. 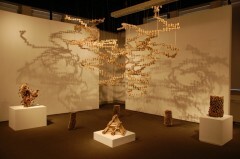 *A Pop-up Project, Pretty Little Things, 2010. Since art appreciation and collection has historically been considered a past-time saved only for the affluent and rich, it is no surprise that a fine art gallery can sometimes be an intimidating place to enter. However, a new take on the art gallery in DC, called Morton Fine Art (MFA), will challenge every preconceived notion you may just have about the art world. Morton Fine Art is an art hybrid – one part traditional art gallery and one part, well, one part anything but traditional. This month, MFA is presenting Pretty Little Things, a jewelry exhibition, as part of their on going and super successful exhibition concept called *A Pop-up Project. We Love DC had the opportunity to talk with the founder and owner of MFA, Amy Morton, about Pretty Little Things, DC, and what art currently hangs on her living room wall. Still looking for things to do this holiday weekend? 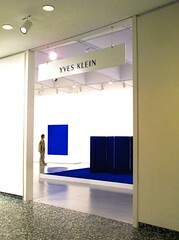 Why not head over to the Hirshhornto check out the uber-successful Yves Klein: With theVoid, Full Powers exhibit. This may be your very last chance to see the work of a creative genius as the exhibit will be closing on September 12th. You won’t want to miss this one. 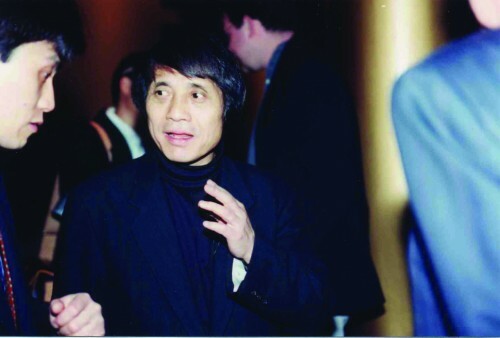 Tadao Ando, March 2, 2002. Image Courtesy of the National Building Museum. Since 1997, the National Building Museum has been offering professionals, tourists, and aficionados the opportunity to hear some of the most distinguished architects and designers in the world speak about their passion. Paul Kilmer, Director of Public Programs, introduces the Spotlight on Design speaker series as an occasion to “celebrate an architect, designer or firm, and give them the opportunity to share with us the significance of their work – celebrating design innovation”. Furthermore, it allows us to “demonstrate how critical and important good design is to quality of life”, says Kilmer. Past speakers have included Pritzker Prize Laureates, American Institute of Architects’ Gold Medalists, and the American Society of Landscape Architects’ Medal recipients. Oh how I would have given anything to be a fly on the wall when Tadao Ando presented! In the spirit of the Spotlight on Design speakers series, We Love DC chats with Martin Moeller, the Senior Vice President and Curator of the National Building Museum, who gave us some details about the makings of the wildly popular lecture program and how he feels about design and architecture in D.C.
For all local artists out there, tomorrow is your last chance to enter for a spot to be featured in a solo exhibit at the Arlington Arts Center. Artists who “produce cutting edge contemporary art in any/all media, and who live or work in Virginia; Washington, DC; Maryland; West Virginia; Delaware; or Pennsylvania” are eligible to submit exhibition proposals. Furthermore, all work must have been completed within the last 3 years in order to be considered. 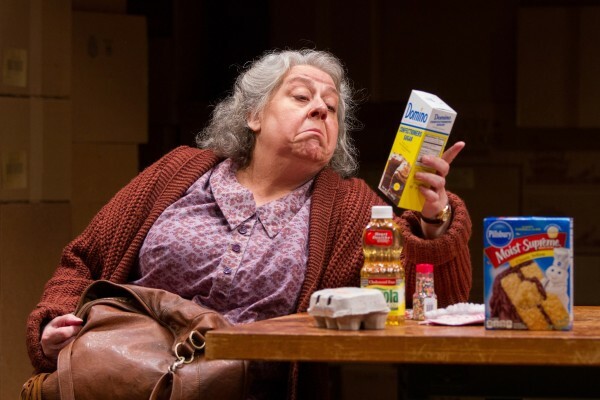 For more information contact the Arlington Arts Center at 703-248.6800. 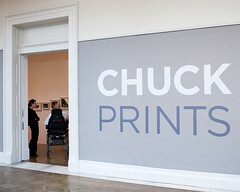 Exhibition titles are supposed to be exciting and alluring. They should make you go, “I have got to see this”, or at least, grab your attention for a second or two. The exhibition title for the current Pousette-Dart showing at The Phillips Collection is anything but that. Nothing about the phrase Predominantly White Paintings gets you jumping out of your chair, heading for the door (unless of course you are familiar with the artist’s work already). However, you may want to reconsider. Richard Pousette-Dart is among the most celebrated abstract expressionists of the avant-garde New York, sharing the limelight with the likes of Pollock, Gorky, and de Kooning – a circle of artists that only a very few (of the very many) had the artistic merit and vision to join. During the early 1950’s, Pousette-Dart departed from his distinguished colorful paintings and arrived upon white, not a color, but simply a characteristic of light’s reflecting powers. 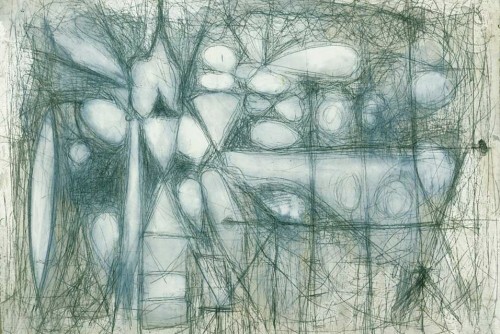 Now, for the first time in over 50 years, twenty-five of Pousette-Dart’s Predominantly White Paintings are on display. And let me tell you, nothing about them is boring. 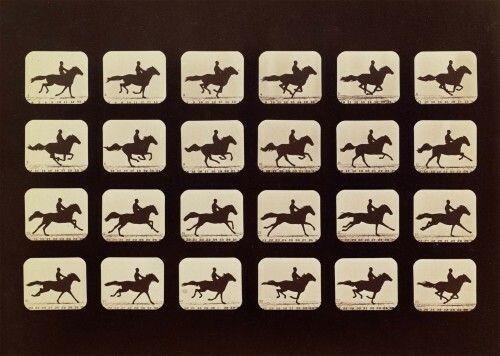 Eadweard Muybridge, Horses. Running. Phryne L. Plate 40, 1879, from The Attitudes of Animals in Motion, 1881. Albumen silver print. 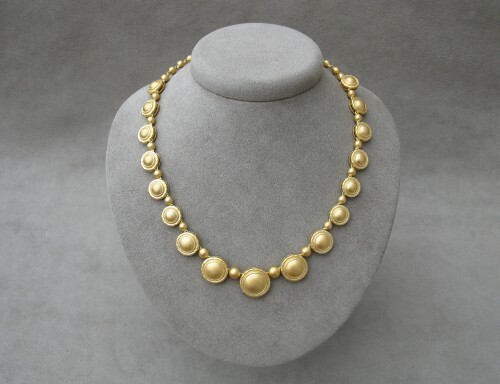 Image courtesy of the Board of Trustees, National Gallery of Art, Washington, Gift of Mary and Dan Solomon 2006.131.7. Helios: Eadweard Muybridge in a Time of Change at the Corcoran is the world’s first, comprehensive study of the photographer’s influential and inspirational career. Reigning over the field of photography for much of the second half of the 19th-century, Muybridge was a pioneer of the visual medium – bringing together both science and art in a seemingly effortless fashion. The exhibition includes over 300 elements, spanning from books – to albums – to stereographs (and even a Zoopraxiscope), all of which portray pieces of a process, establishing the foundation of the Muybridge legacy. 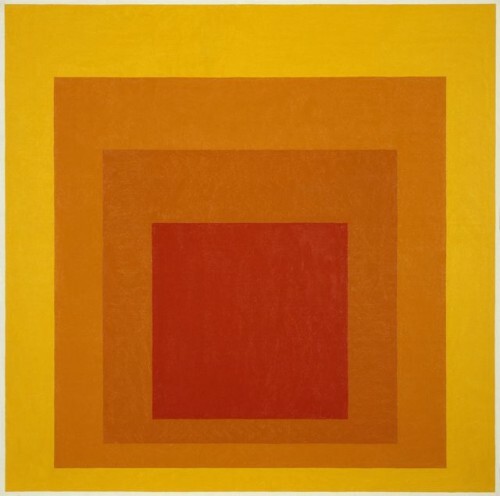 Josef Albers, “Homage to the Square: Glow,” (1966). From the Hirshhorn’s collection. Abstract art is void of narrative. The composition often speaks only through the viewers mind. A type of understanding through speculation, providing the sort of simple canvas that the imagination needs in order to thrive. Josef Albers (1888-1976) was a master of the subjective canvas, an explorer of color and an ambassador for the abstract form. We Love Arts: Festival Fever! Considering the headlines that dominate news pages these days, who could blame us for craving a bit of escapism? Luckily, an avalanche of September festivals offers ample excuses to wear kooky costumes or to (attempt to) speak in charming accents, to relive the past or to leap into the future. Sometimes we just need a few blocked-off streets or patches of green to catapult us out of familiar surroundings and demand we get lost in the sights, sounds and tastes of another time and place. Some festivals draw repeat attendees who share such a passion for re-enacting and re-creating it seems more a way of life than a weekend hobby. (Some of these participants seem, sadly, to have been born into the wrong century.) Other fests prove more laid-back—a mix of cultural authenticity and comical distortion. But common denominators? The beer’s usually a-flowin’, the people watching superb. The season kicks off September 5 and 6 with the Virginia Scottish Games and Festival in The Plains, Virginia. I first attended this lively event a few years back (having just returned from 16 months in Scotland), with expectations, in hindsight, a bit too lofty. (Yes, silly me, I thought I would actually meet some Scots and hear some of those dreamy, melodic accents.) Instead I did find some authentic culture (cuisine like tasty yet feared haggis and steaming meat pies) sprinkled with a bit of stereotype (or perhaps slightly-fudged cultural truths, like the presence of England‘s Newcastle beer) and a few unexpected oddities (a parade in which kilted Americans showcased their plaid-clad “Dogs of Scotland”). But the atmosphere carried charm all the same. 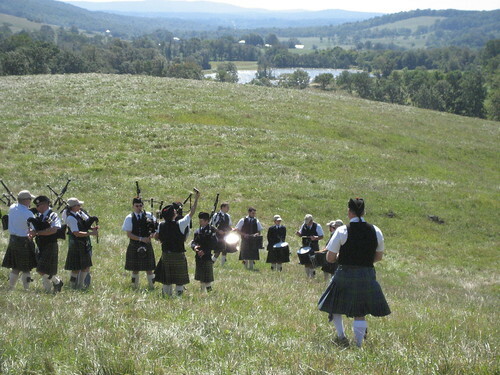 I watched proud Virginians sport their family tartan, sheepherders demonstrate their craft, Highland dancers do their joyous jigs and bagpipers echo the captivating drone of their instruments up into a piercing blue sky and out into the rolling Virginia hills. It’s Scottish culture with a twist, but a highly enjoyable day in the countryside all the same.